Over the years, before people started taking Technology “Serious”, Users have always bought phones because they just had to, or, to help/assist them in most of their endeavors and finally, to feel belonged. Fast forward to now, people in this modern 21st century buy a device because of what the phone can actually do and yes, the amount of pressure it can withstand. 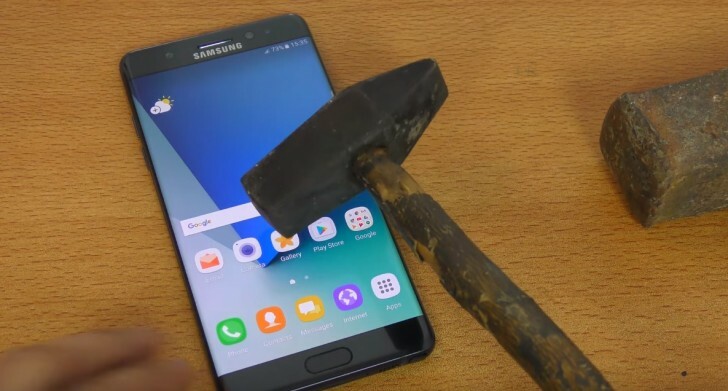 We have seen lots of reviews, starting from Cold water test, Hot water test, Coke Test, Champagne test (Yes, people can be that crazy) and finally this, A Hammer Test and the device which is currently undergoing this punishment, is the Samsung Galaxy Note7. For some time now, i am beginning to think the Samsung devices mostly fall for these punishment in the hands of reviewers and aside that, i think they like it following what they did this to the Galaxy S7. A YouTuber who goes by the name xeetechcare has been putting the Note7 into series of tests, which ranges from trying to damage it with a knife and then, two hammers. First a small one knife and then a large one (Poor Phone :( been murdered ). But do you think the Note7 can withstand this? Read ahead to find out. Reviews has it that the Note7 comes with a gorilla glass which is more reason why a knife test would not have any effect on the device.The Galaxy Note7 sports a Gorilla Glass 5 on the front and it survives the knife test pretty well. Fortunately, that is not the case for the Hammer Test as the phone was actually “crying” its way into destruction. But on a serious note, was this YouTuber thinking the Note7 would survive the test? Below is a Video where the whole event took place. Watch and See how the Note7 was awesomely murdered. And Yea. Do Share with friends. Tecno or Gionee: Which Chinese Brand will Thrive in Nigeria this year? You can Read More about the Galaxy Note7 Here.